To have healthy free-roaming horses on healthy ranges gathers are necessary! Gathers are used to manage genetic diversity, population control and to remove excess horses. Grasslands that could support thousands of horses in one area would minimize the management of genetic diversity and inbreeding. In the Great Basin and most public land controlled by the BLM is low quality grazing land that is unable to provide enough water and forage for the density of horses it would take to maintain genetic diversity without management. For healthy horses on healthy lands population control requires frequent gathers, removals and management for genetic diversity. Some advocates believe predators could control horse populations. The density of predators would need to be so high that it is not even an option. Some HMAs are so over populated already that horses are dying from a lack of water and starvation and the ranges are not healthy. Add severe weather or diseases and those horses could lose 30% or more of their population. Advocates don’t fool your selves, predators, lack of water and food, severe weather or diseases create far more stress and are harder on your horse families than gathers and removals. Nature does not worry about being nice. 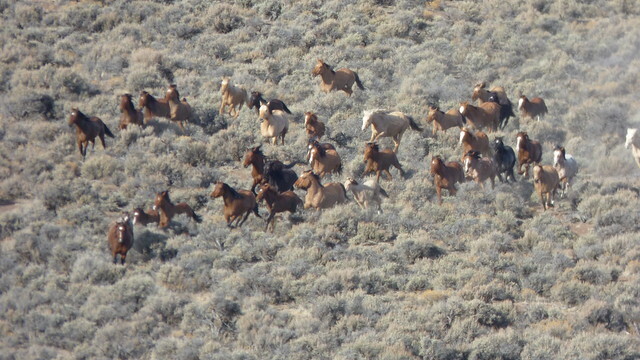 I really don’t believe most wild horse advocates are a friend of free-roaming horses. Most are allowing their emotions to run wild and blind them to reality. My advice, enjoy the free-roaming horses and look the other way when the hard but necessary management decisions need carried out. If you are unable to do that, the only other solution is to remove all free-roaming horses from public lands. Horse should not be forced to suffer just because we want free-roaming horses. By now I know many advocates would be attempting to divert my attention by screaming, “THE COWS, THE COWS.” And I agree, the free-roaming horses need the same intense management on public lands that other livestock already recieve and we need to cut the appropriate management level of horses in half just as we have the cattle. The Wild Horse & Burro Program also needs what the ranchers have, the ability to sell excess animals. For healthy free-roaming horses on healthy public lands frequent gathers are necessary!